Pattern: a combination of Lillyfield and Anemoi mitten patterns. The shape and structure, including the cuffs, gusset thumbs, and “frame,” are taken from Anemoi, but the inside motif is from Lillyfield. Yarn: SandnesGarn Lanett, 100% superwash wool, red (4128) and off-white (1012). I used less than 1 skein (!) of each. The yarn is fantastic – very soft and not at all itchy. The strands grab one another despite being superwash, and the yarn has a very nice halo. This is great for Fair Isle knitting because all the little spaces between the stitches close up, any wonkiness is concealed, and the fabric looks wonderfully even. Needles: I knit these using the 2-circ method, with US 1 Susan Bates circular needles. The tip of the mitten and thumb were knit with Susan Bates dpns. My gauge, in pattern, was about 10 spi and 10 rpi. I bought the yarn for the mittens on December 8th, 2006. The matching hat was finished on January 1st, 2007. The hat and mitten combo seemed to be on the fast track to finish-dom! The whole mitten idea went dormant for two years! We next heard about it on December 14th, 2008, when I documented all my so-called “Dangerous” projects. The bulk of mitten knitting took place in January and February of 2009. I had to do a lot of finagling of the two patterns: recharting and swatching, and worrying about mitten fit. Mitten fit, people!!! Did you think you’d ever hear anyone say that, let alone write a whole post about it?!? And just as I was nearing completion, some pesky little detail forced me to frog about 2″, and try again. So re-knit I did, and during the rest of February, off-blog, I knit the matching left mitten. The only thing remaining was knitting the two thumbs, weaving in the ends, and putting the mittens in my coat pockets. Maybe a few hours’ worth of work, at most? I was basically done. But other projects took center stage. My spring was filled with frantic lace knitting, including that huge Crown Prince Square Shawl for my grandma’s 80th birthday. And instead of quickly finishing up the mittens in time to wear them during the chilly spring, and then moving on to the lace projects, I let them ferment in my knitting basket, thumb-less, for almost 9 months. D’oh! Palm to forehead here because not only did I not get to wear them in the spring, I also completely forgot all the details of the project. When I picked up the mittens again a few days ago, I was totally clueless. Which needles was I using? There were several different sizes in the bag… Did I plan to modify the Lillyfield instructions for the thumbs in some way? Good thing only the thumbs remained – they were pretty easy to improvise. On the plus side, the mittens are finished in time for this winter, and they are fabulous. They feel a little bit loose on my hands, but I think that’s the intent. I don’t typically wear mittens, so I’m not the best judge of fit. I can tell you that there’s definitely no “finger claustrophobia,” and I can wiggle and bend my fingers without a problem. I think I’ll really enjoy wearing these! I dare say, these were worth the wait! Wow, these are beautiful! Amazing work! Are you kidding? Those are FABULOUS! ABSOLUTELY worth the wait. I love love love them against the black coat, too. They really pop! I can’t believe it’s been 3 years! I remember the first blog post about these mittens, I just assumed they’d been done for ages! Worth the wait is right, they’re beautiful! they are glorious! almost like a bejewelled crown for each of your hands. your persistence paid off in spades! They are just beautiful and look nice and warm. Oh, they are SO beautiful! Someday I’ll get around to knitting my OWN perfect mittens, with your inspiration! So pretty! I’m working on a Selbuvotter Frankenmitten and am swatching the whole thing – looks like I’m going to frog back to the beginning. Glad to know I’m not the only one who takes so long to make mittens. Congratulations on the FO. They’re lovely! And yum, if they’re made out of Lanett, they’re excellently soft. Lanett is one of my favorite yarns ever. Beautiful! 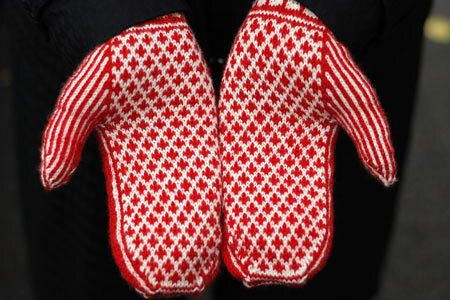 Yes, mittens are supposed to be a little loose — the air space acts as an extra layer of insulation. Oh, they are so gorgeous! Just in time for the holidays and the snow. The root of your improvisation is improve. I love using Lanett. I made a red pi shawl for a baby boy blanket years ago. Thanks for the re-styling encouragement. I love the sharpness of the colours and design, the way all the details stand out. They are top notch! Absolutely love the pattern, and the red and white is perfect! I have a pair of Selbuvotter mittens that I started last year but didn’t get finished, and I was inspired to pull them out last night after reading your post. These are gorgeous. I have at least one pair of socks that are in a similar state, waiting for the Kitchener-ing of the toes. It’s silly, but I’ve finished so many other projects in that time! Wow – those are really beautiful mittens! Great job. Just beautiful – I had been following the sage and admiring your “intrepitude” last winter. These mittens will brighten even the most gloomy winter day ! ! They are luscious absolutely adore them. Worth the wait indeed. 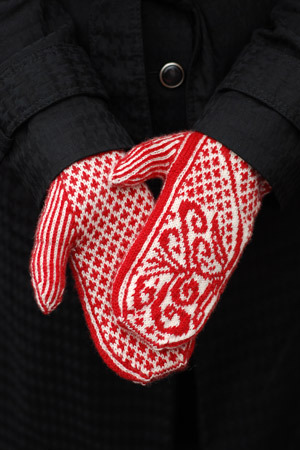 Your new mittens are beautiful and timely too. The mitts are stunning. And you are far from the only one who has projects waiting for a button or just weaving the ends in. Wow has it really been 3 years? I remember when you started these because I’ve been thinking about both of those patterns for a looong time. These look like they were well worth the wait! the colors just sing together – beautiful 🙂 well worth the wait! They’re beautiful! I love both the patterns (they’re in my queue) and the combination is lovely. I will say that I KNOW if any sort of colorwork marinated that long for me, my gauge would change over time! Very nice! I feel like I want to make a pair, too! Very lovely! I’ve always wanted to do a pair of colored pattern mittens — just never taken the time! So lovely! It’s wonderful when a project that has been waiting to be finished gets done. I’m going to put the pattern in my queue. Very nice! Are you hooked? 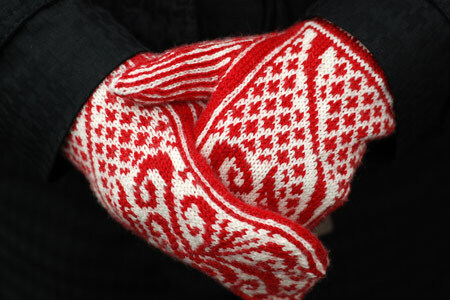 I love the Selbu knitting style and find myself knitting mittens like crazy now! definitely worth the wait. they are perfectly lovely. These are just lovely. Thank you SO much for sharing all the details of the journey with us. I for one thoroughly enjoy every detail you share :). Definitely worth waiting for, Kathy. They are beautiful, and I love anything red and white. What gorgeous mittens. I am a BIG fan of red and yours are too beautiful. Thank you for sharing it with us. Beautiful mittens! I made Anemoi last year and I love them. Definitely worth the wait! Gorgeous job! I have had trouble pairing red and white — after a cold water soak I’ve ended up with pink and white. Hopefully your red is absolutely colorfast. If you are worried that it isn’t you can explore some products like Retayne and/or Shout Colorcatcher sheets. Those mittens are outstanding. I love the way the design pops in red and white. Soooo pretty. Very, very nice. I am awed. Ah. Perfection in a mitten. Love it. I, too, will be adjusting my Lilyfield mittens – turned out to be way too long for my hands. I hope mine turn out as well as yours did! What a blessing it must be to not own a white cat. Lovely gloves, but the stark black coat (sans cat white cat hair) is so distracting. amazing…just amazing. They are just beautiful. Love the red! 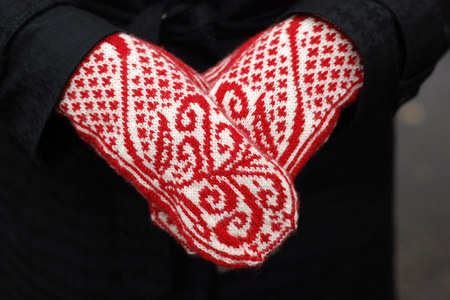 I guess I’m a little late in commenting but these mittens are Very beautiful! I’d love to wear them.